…ignoring the negative news that the Spanish government failed to secure a majority in an election last Sunday and PM’s difficulty in implementing austerity measures to cut the country’s deficit. Italy’s PM said Spain could reignite the euro-zone debt crisis if it fails to impose adequate austerity measures. 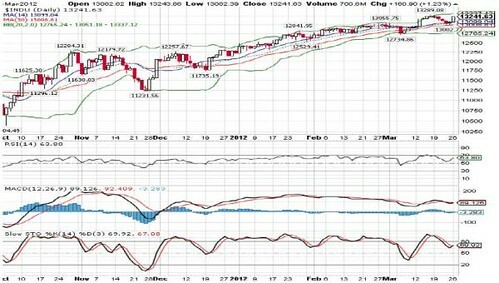 The Dow Jones rebounded 120 points or 1.2% following last week’s 1.1% slump. The rally was driven by a strong German’s business climate index, speculation that the EU’s meeting on 30 March will increase the size of its bailout fund and Bernanke’s pledge for continued accommodative policy to reduce joblessness.